This step-by-step guide will show you how to get a Windows 3.1 computer connected to the Internet using Virtual Modem and PPP. If you have not already, please follow the instructions how to set up Virtual Modem. 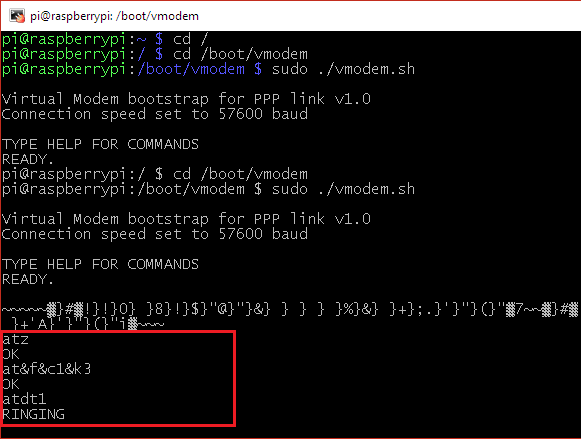 Make sure the serial cable is connected to the Raspberry and the vmodem.sh script is running on it before attempting this part of the guide. 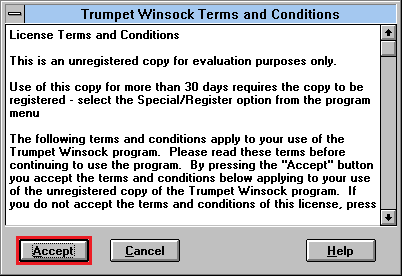 We will go through the steps how to install Trumpet Winsock 3.0 revision D on your Windows 3.1 computer. We will also configure typical settings for dial-up over PPP. I have not tested other version of Trumpet Winsock, so your mileage may vary if you use other versions. For the sake of this tutorial, we will also install Netscape Navigator 3.0, but you're free to use any web browser. Please make sure you have VModem set up and running first before attempting the following steps! I am currently in the process of writing this guide. At it's current state the tutorial is in BETA. This message will be updated as I continue to work on this tutorial series. If you haven't already, I highly recommend registering Trumpet Winsock and compensating the author for such an amazing piece of software, which almost single-handedly opened up the Internet to the general public. Go to the Tattam Software Enterprises web page and download Trumpet Winsock 3.0 revision D. The file should be called TWSK30D.EXE. Copy it to your Windows 3.x computer into an empty temporary directory. Open up File Manager on the Windows 3.x computer. Run TWSK30D.EXE. It will self-extract the installation files. If you do not see the extracted files, you probably need to refresh the file listing. When the installer program starts, choose Install. If you see the following prompt, just hit OK.
Click Yes to rename additional Winsocks. You can accept the default install directory and hit OK.
You can also accept the default program group and then hit OK.
Trumpet will propose to add it's home directory to the PATH variable under DOS. You can go ahead and accept this change. Trumpet will ask to review the license terms. If you agree with the terms, hit Accept. For the DNS server, type in 8.8.4.4. This is the Google's public DNS server. Note! You may choose any DNS server you like, but for simplicity's sake, I've chosen Google's DNS server. In the Driver section, choose the PPP option. No other settings in this window need to be set. In the following screen check the COMM port. You will need to select the correct Serial COM port. If your Raspberry Pi is connected on COM port number 1, select COM1. Make sure baud is set to whatever VModem has been set to operate at. By default it should be 57600. Nothing else should need to be changed. Hit OK. In the Login profile window, it doesn't matter what user name you choose to use. But the phone number is important. 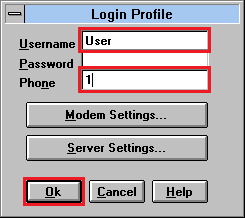 Under default settings in VModem, the phone number to establish a PPP connection is 1 (one). Make sure it is entered as you see in this window, then hit OK.
Hit OK on this message. It's always a good idea to remove any floppies before (re-)booting a computer. Make sure the Raspberry Pi is connected over serial with the Windows 3.1 machine. 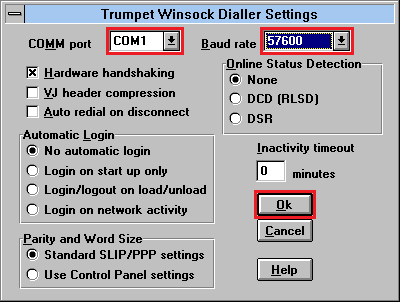 On the Windows 3.x computer, run Trumpet Winsock. Under the menu, choose Dialler and then choose Login. You will see Trumpet issue a bunch of Hayes modem commands and then try to dial out to number “1” (see red box below) and then be greeted with the login handshake. After a while, the window should go away and now you're connected to the Internet. You will need to download and install a web browser before you can browse web sites. You can choose any browser you like. For the sake of this tutorial, I've chosen Netscape 3.0 Gold Edition for Windows 3.1. Once you have downloaded the file, copy it onto your Windows 3.1 machine, then run it to install. The file is over five megabytes, so it will not fit on a single floppy disk. You will need to split the file into smaller chunks to copy it onto floppy disks. You can use a free utility such as HJ-Split to accomplish the task. You can re-join the files with the same utility for the respective system. Not many websites work with older web browsers. So I went ahead and compiled a list of websites that work. I also made a easily-accessible gateway website to access archived copies of a selection of great websites that you can browse with your retro machine. Click here to see the list of websites that will work with legacy web browsers! Click here to access the gateway website, or type in the URL “wayback.steptail.com” using any legacy web browser! It is possible the PPP session has timed out. 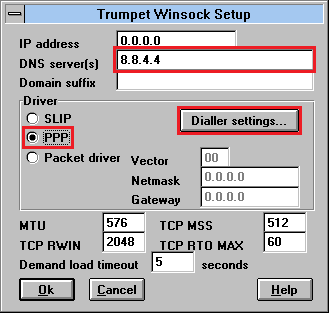 Go back to Trumpet Winsock and Login again by selecting Dialler –> Login. You can adjust the timeout value on the Raspberry by editing the ppp.sh file. That Compaq background rocks. Where can I find it?